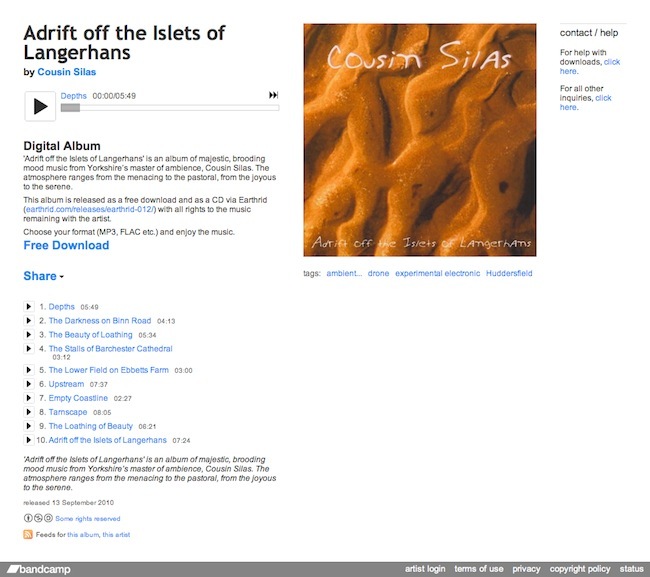 First up... we have my fave ambient electronic wizard... Cousin Silas with an album entitled "Adrift off the Islets of Langerhans". Released as a free download and as a CDR on the Earthrid netlabel (earthrid.com/releases/earthrid-012/) ... it is an album of majestic, brooding mood music from Yorkshire’s master of ambience. The atmosphere ranges from the menacing to the pastoral, from the joyous to the serene. 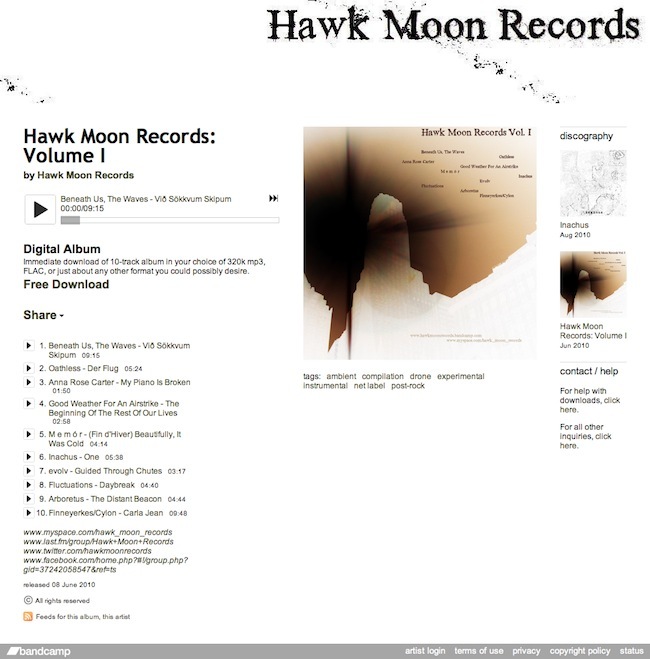 Containing existing faves: Beneath us, the waves and Good Weather for an Airstrike... this compilation from Hawk Moon Records is simply divine. Atmospheric soundscapes that soothe and inspire. Powerfully evocative yet subtly ambient... this is a very engaging and cohesive release. Recommended. Streaming only... no longer available for download. 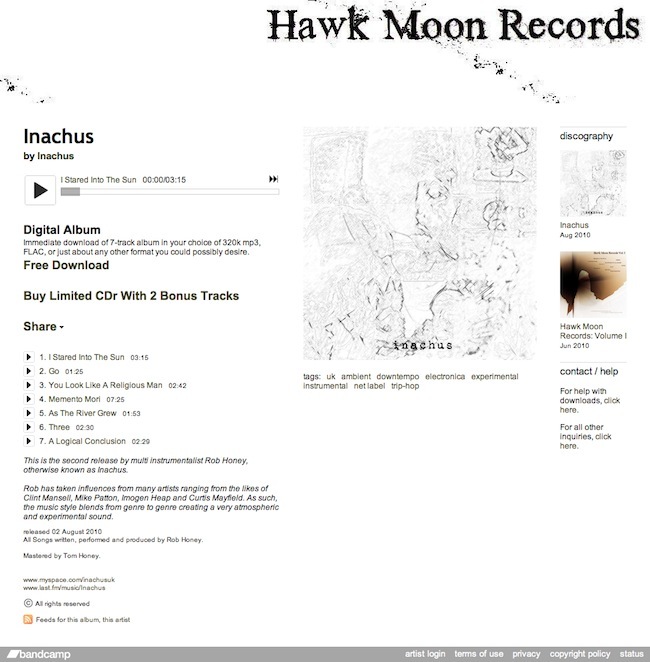 Following on from Hawk Moon Records's compilation... is a release from one of their artists... the multi-instrumentalist inachus with a self-titled release that is coherently described as "very atmospheric and experimental". He mixes an instrumental hip-hop vibe with post-rock soundscapes and glitchy nuances to create something wonderfully unique and entertaining. 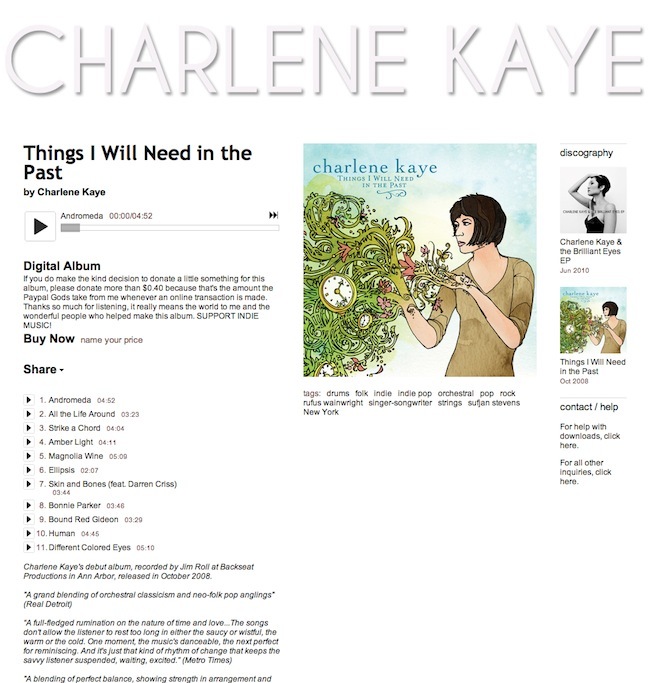 Next up we have the truly awesome Charlene Kaye with two wonderfully intelligent and foot-tappinly entertaining releases: the brilliant eyes ep and things I will need in the past. I love intelligent lyrics, a great voice and well structured orchestration... and you get all three with Ms Kaye's music. She's in the same school as Regina Spektor... and that is a compliment. Recommended. Pay what you can - minimum $0.40 per download. Last up... we have my boy JD Blundell's High School band all natural. According to the blurb... the tracks were recorded over a span of three years (1995-1998) and are finally being mixed down from a 4-track cassette to digital to share them with the world (or at least for our wives and mothers). They are pretty rough... but they do show potential... especially on the track "a place in memory" which needs, imho, an accordion. Their sound reminds me of Graceland-period Paul Simon. At the end of the day, I will support awesome musicians and love the bandcamp concept. As such, I ain't going anywhere. 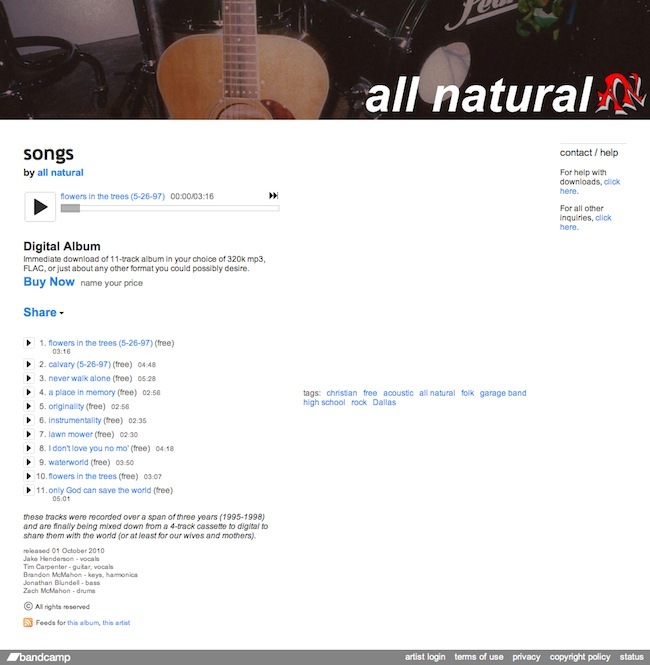 The all natural album is "pay what you'd like."